Program Features Course to Steer Calculations - Route Optimised Departure - Course over Ground - Dynamic Tidal Stream - Animate Routes - Tide & Water Track Roll - Track Plotter - Waypoint Editor - SOLAS Compatibility - Course and Tidal Vectors - Cross Track Error displayed - Interfaces to internal GPS - Tidal Stream - Incorporates Tides Program - Range Circles - Configure Displays - Tidal Data - Tidal Stream Reports and Graphs - Insert Wind Values - Select Charts from server - Copy Screen and Route Buttons - GPX for Waypoint and Route - Import GRIB Files. 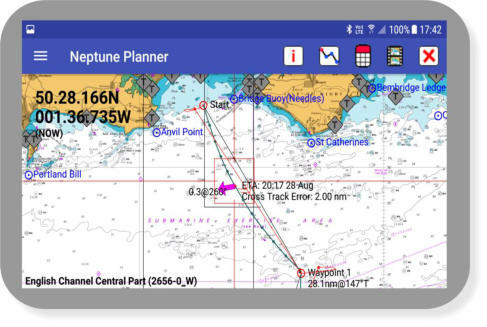 Passage Planning app On your Android Mobile Phone or Tablet Neptune calculates the Course to Steer and the Optimised Departure Time from its built in tidal database (you don't need to go on-line). Neptune calculations are not time limited and you can passage plan and predict tides for now or for many years ahead as you wish. Raster charts, Imray and Outline are easily obtained immediately prior to sailing. With Route animations you can virtually sail your course to see the effect of wind over tides on your intended route. After a calculation you can easily share your plans for SOLAS compliance.